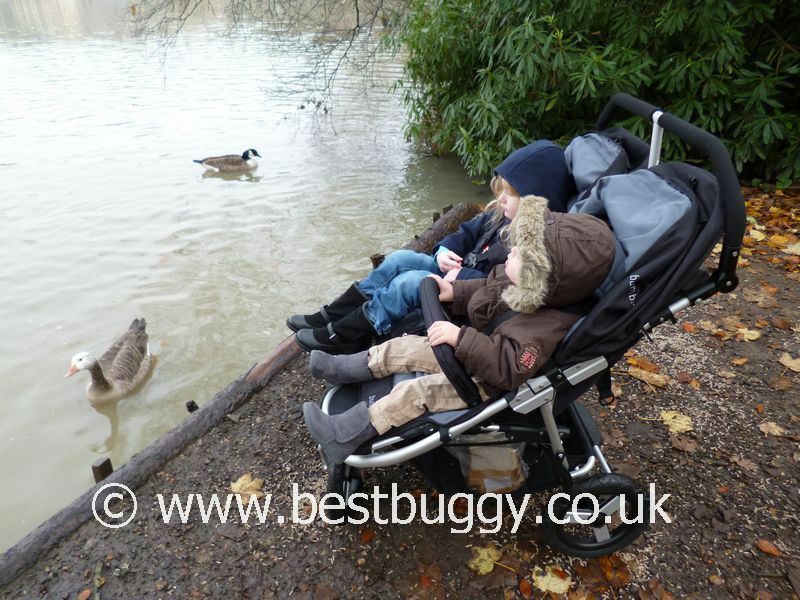 The Bumbleride Indie Twin pushchair is a double stroller which I have wanted to try for a long time. The reviews I had read had been generally positive, and I love how smart the Indie pushchairs look with their bright colours, quality fabrics and sleek looking wheels. We had had the single Indie last year and naiively half expected to be writing the same review about the double – but the Indie Twin is very similar, but different! Our first impressions of the Bumbleride Indie Twin were as expected - the Indie twin looks smart, good quality and begs you to push it. It is a really beautiful looking pushchair – you want to reach out and touch the handle, feel how it pushes, and look at the fabrics. The Indie twin is very clean looking with a simple but stylish chassis. The wheels, with their 3 simple metal spokes are one of our favourite features. We love the quality, strong, exterior fabrics in bright colours. We really like that for 2013 Bumbleride have managed to use 50% of their exterior fabrics from recycled PET bottles!! We also like that their interior fabrics are made from 50% bamboo fibres, to help with the temperature regulation of a child and absorbing any moisture. We also love that you get newborn head huggers, bumper bars, a cupholder, tyre pump and raincover, all in the box, along with the pushchair! The Bumbleride seats are well padded and look comfortable. However last year we had had issues with the single Indie seat being too recumbant for both children, HOWEVER when we put our 2 and 4 year old children into the Indie Twin seats we were amazed to see that both our children looked incredibly comfortable, sat in upright seats, with good leg space, and head room. This for us immediately lifted this whole review for us, because having two happy children, sat comfortably, is largely what finding a good pushchair is all about. To be honest, the Indie Twin seat was SO much a different experience for us than the single, that we have since discussed with Bumbleride UK whether anything has changed with the seat units over the last year, and whether we need to get another single Indie back here to BB HQ to review. The seating positions on the Twin are fantastic! Our 4 year old (107cms tall), is now able to fully voice whether she is comfortable or not, and she absolutely loved the Indie Twin. She doesn’t really need to be in a pushchair these days, but on the shopping outing pictured, we wanted to do some sneaky shopping to send off to Father Christmas, and she didn’t mind at all being on board for the ride. Believe me, if she isn’t happy, she will protest!! I was a bit concerned that the footrests do not point more vertical to the floor for longer legs, but it did not seem to bother our eldest. As the photos show, she seemed fine, and even crossed her legs at a couple of points. The new 2013 US Indie pushchairs have a deeper footrest but we do not know if the new UK pushchairs will have these. We stayed out later than we anticipated shopping, and towards the end of the outing, our eldest child asked to lie down. She had plenty of room to do so and snuggled up happily in the tall seat unit with her legs raised up. Due to the seats and hoods being independently adjustable, our youngest could stay sat upright, with his hood up to watch the world go by. Both children could have their harnesses altered to suit them. We loved how our youngest (87cms tall) could have his harness restricted at the rear of the seat to make it fit him more snuggly, whilst our eldest had plenty of room left in the harness for growth. Given the Indie Twin can hold up to 40.5kgs in child weight, her older toddler weight posed no problem. There are a choice of 4 well spaced height settings, however the harness does need rethreading to alter, which is a tad fiddly. Given the harness has such adjustability, plus there are newborn headhuggers included, I feel confident that the harness could be adjusted to suit a small baby. We like the harness on the Indie Twin a lot – its chunky and sturdy although the buckle is a little hard to undo. There is a new 5 point breakaway harness for 2013, and we hope that it doesn’t break away too easily! The promo video seems to make it look like breaking from 3 to 5 points is an additional step though, so that is positive. There are good shoulder and crotch pads on the harness. We like the silky feel of the harness straps too, without any slipping. We really like having lift up leg rests especially for babies or sleeping children. However the Bumbleride leg rests are tricky to adjust. There are two round press in buttons which are located on each side inside of the leg rest frame at the knee. So to access them involves using both hands to get fingers both underneath the leg rest, underneath the fabric and inside the frame as well. It really is fiddly, especially the centre buttons, which really need the centre seat fabric popper undoing (or it pings open anyway). What I find most frustrating is that the footrests ALWAYS are horizontal when the pushchair is opened. So every time we opened up the Indie (single or double) we had to run around to the front and put the foot rest back down for our two older children – the flip side is that it would be handy though to have the footrest already up for a younger child! I do find this irritating to have to do, especially when its freezing cold or raining, before I get the children out of the car. Bumbleride UK have since this review told us that it is possible to simply push the footrest back down each time without using the buttons. The seat recline is a toggle one which is great for finding the perfect level for any age child. We found it easy enough to push the button in and release the seat to the desired position from upright to lie flat. However pushing the seat upright again was a little harder to do and took two hands and a big push with a shoulder or elbow. The seats do lie completely flat, thus are suitable from birth. The hoods on the Bumbleride Indie Twin two individual large hoods. There is good head room for even an older child. The hoods are cosy for winter, but also great for summer. The rear of the hood fabric (where the storage pockets are) can be zipped off, which then provides good ventilation and leaves the hoods free to be moved forwards and backwards, to find the best shade for a child. The hoods have an SPF Factor 45 and reflect heat back out. There is a small mesh window on the top of the pushchair but it is not really a viewing window. The Bumbleride Indie Twin comes with a cupholder. It fits neatly onto the side of the Indie Twin, however it does increase the width of the pushchair to the point where the pushchair would no longer fit through a standard doorway – it is a shame there is no rivet to hang it on inside the frame, rather than outside of it! (At 73.7cms wide without the cupholder on, the Indie Twin should sail through most UK doorways.) The Indie Twin also comes with two single bumper bars which slot into the side of each child’s seat. The bumper bars were a little fiddly to fit – they have to go through fabric into the frame – so we put the bar on for the youngest but we left the bar off for our eldest, so that she could hop in and out easily – a swing away bumper really would be perfection! 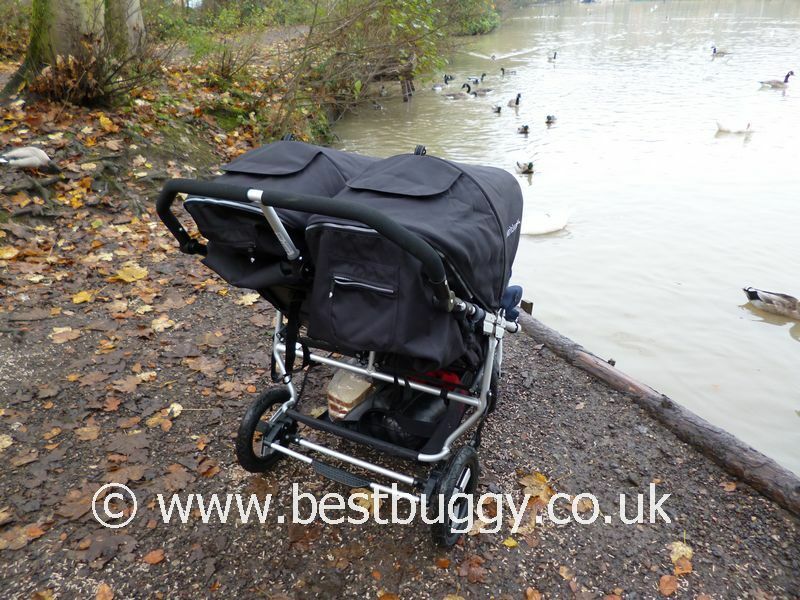 These bumper bars fold flat so that the pushchair can be folded with the bars left in situ. BUT the buttons for folding the bumper bars are on the inside of the bumper bar which is really awkward to get to. However the bumper bars have also been redesigned for 2013 and the buttons will now be on the outside!!! Plus it is a one movement to lift the bumper bars back upright when unfolding! Hurray!! However, having the bumper bars in situ, requiring to be folded down to fold, are just another step to do when folding and unfolding the pushchair. Although they are an optional extra, we LOVE the snackpacks for the children! They are just sooooo cool! The storage basket of the Bumbleride Indie Twin is one of the highlights for me. Its huge, and accessible. There’s nothing to obstruct access from the rear. It is easy to access items from the side, or even from the front when the footrests are raised up. We felt that things were secure in the basket – strangely more so than with the single, but maybe the extra space meant we didn’t cram as much in!! On our shopping trip we got lots in the basket. There are also two good sized zipped storage pockets on the backs of the hoods. These were really very handy for my keys, camera, phone etc. The raincover of the Indie Twin is a soft plastic which is easy to fold into a fairly small package which is great as the raincover does not fill up the basket. It was really easy to throw over which is what we like from a raincover. It does fasten at the bottom and sides with velcro tabs. We love the all terrain tyres on the Bumbleride Indie Twin. These are 4 x 12″ air filled tyres, which combined with the rear suspension, give a lovely smooth and bouncy ride. The Indie Twin was really a pleasure to push. 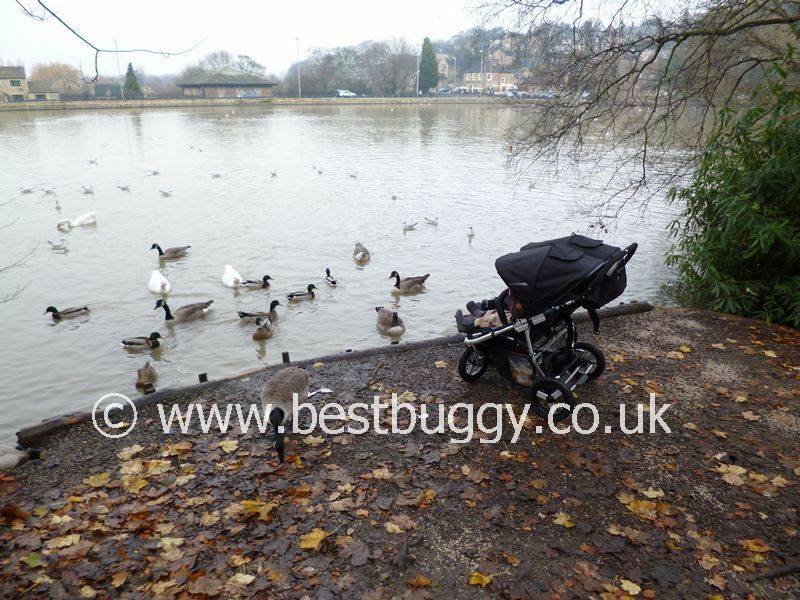 The Indie Twin is a rare off road pushchair where the front wheels do not need to “wiggle” the wheels straight to get going again, should you stop at an angle. The front wheels pivot really easily round on the spot! Brilliant! This makes shopping much easier than with other large wheeled, off road pushchairs. We love the 3 spoke metal styling of the wheels. As our photos show, Mr BB decided to test out the off road capabilitites of the Bumbleride Indie up and down some big muddy, leaf covered hills, through tree roots and more. He said the Indie Twin was brilliant to handle and he now wants to keep the pushchair which is high praise from him, especially given the amount of pushchairs we have had!!! Although very simple in design, we really like the small metal flick switches to lock / swivel the front wheels. They are easy to use and very visual. The rear wheels are easy to remove, but the front wheels need unscrewing and carefully fixing back into place, as there are red pins which need to fit through small holes on the wheel forks. The handlebar is quite slim and covered in fairly dense foam. The handlebar can be adjusted to 6 positions. I am 5ft 6 ins tall and I preferred the highest setting. However Mr BB is much taller and he found the highest setting fine for him also. I do prefer to push a pushchair one handed – it is harder to push a twin pushchair one handed, but the Indie Twin was no problem for me to push one handed. It was so easy to manoeuvre around. At just 73.7cms wide, the Bumbleride Indie Twin will sail through a standard UK door. It is one of the narrowest side by side pushchairs on the market. The brake is an easy flip on and off bar at the rear of the pushchair. Sadly our pushchair had a bent brake bar, but it didn’t affect the use. It was clear when the brake was on or off. The Bumbleride Indie Twin can take one or two carrycots which parent face. The carrycots latch into place above the seat fabric. The seat hoods need to be removed. The carrycots have quick release straps so that they can be easily folded for storage or travel. The Indie twin carrycot is one inch narrower than the standard Indie carrycot. The Bumbleride Indie twin can take one or two Maxi-Cosi Pebble or Cabriofix infant car seats with the addition of the infant carrier frame(s). The fold and unfold of the Bumbleride Indie Twin can be tricky - BUT I will admit that practice does make more perfect. Believe me, we have practised and practised and its not been easy at times, BUT we can now fold and unfold the Indie Twin in an elegant fashion, unlike the pile of fabric and metal that I used to end up hidden underneath!! To fold the Bumbleride Indie first of all, two small black trigger sliders need to be slid up the chassis. I will put my hands up and say they are not obvious to spot when you first try to fold and logically you reach further down for the metal sliders that are operated by the black smaller sliders above! Once the sliders have been moved at the same time, then the top half of the seats folds forwards onto the lower half. It is then fairly simple to pull the handle(s) on the rear of the seats and the wheels slide underneath the seat unit into a wedge shaped package. There are two locks – one on each side – to hold the Indie Twin together when closed. These are fairly rudimentary plastic clips which need putting manually into place. They take a bit of doing, but once on, they aren’t likely to pop off which is good. They require a good tug to remove them. From my experience of the single Indie, I was expecting to find the unfold hard, and it can be. As you undo the Indie Twin, it feels natural to open the back up straight. However this urge must be fought as the wheels need pulling out first. This may sound daft, but I take a deep breath and pull the wheels out really slowly and carefully, because otherwise if I rush I end up in a tangle with the back unfolding first. But I take my time and the wheels pull back into position, followed by the unfolding of the top half of the seat pad and back, which then clicks into a straight position on top!! It sounds easy written down but I must have folded and unfolded the Indie Twin numerous times, and its taken me weeks to perfect the fold / unfold and even now, I can’t say I feel confident with doing it whilst out and about. BUT I certainly feel more confident than I did, to at least be able to get the wheels pulled out first. You do also need a fair bit of floor space to open the pushchair in, and to fold it again. The Bumbleride Indie Twin is bulky to lift and even with two of us, we struggled to fit the Indie Twin into our car boot. I have to say I did expect it to be lighter and easier to lift. However we did manage to get it ‘horizontally’ into our car rather than ‘lengthways’ because of the chunky wedge shaped trifold. This freed up a good section of our boot compared to other side by sides which fold in half, and thus need to fit lengthways into our car boot. Its a shame really that the footrest area doesn’t slide between the rear wheels when the pushchair is folded to make the fold flatter. There have been a few changes for 2013, however we may well not get all these in the UK in 2013. Some, like the use of recycled materials, 5 point break away harness, deeper footrest, and easier to adjust footrest and bumper bar we have mentioned above. There are also new colours although we will probably not get them all here in the UK. The frame has been slightly redesigned to make it more suitable for jogging with by placing weight further back on the pushchair. I have to be honest and say that a number of my irritating niggles with the Indie pushchairs should be eliminated with the 2013 changes, and I am actually very excited about the new 2013 Bumbleride Indie. 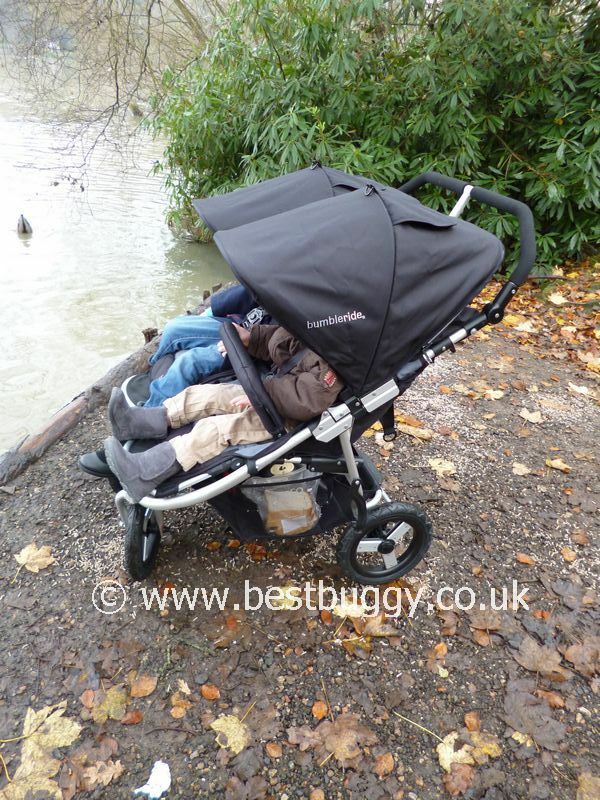 We have been pleasantly surprised how good the seating and harness positions of the Bumbleride Indie Twin are. The children both looked very comfortable and could rest or watch happily in the seats. The Bumbleride Indie Twin was easy to push and manoeuvre even one handed in tight spaces. The huge basket, storage pockets and lift up footrests were all great. However the bumper bars and resetting the footrests are additional steps to what is already a challenging fold. BUT hopefully the UK will get some of the 2013 changes. Ideally if we could leave the Indie Twin open and ready to walk out of the house with then it would be fabulous. The Indie Twin really needs an easily accessible car boot. It would lift easily into an estate car for example. However, the good seating position combined with great quality and style have left us wanting to take another look at the seating position on the single version of the Indie; to see why the Indie Twin seats are so much better than the single Indie that we had last year. If we can feel happy that the seating position of the single is similar to the Twin, then I can quite easily see us ordering another 2013 single Indie, especially with the fab 2013 changes to the footrest and bumper bar!! We would love to try the toddler board out too! Above all, it is the styling, looks, push and quality are something that make the Bumbleride brand stand out above the rest! We would recommend a Bumbleride Indie Twin – but buy the 2013 version!! 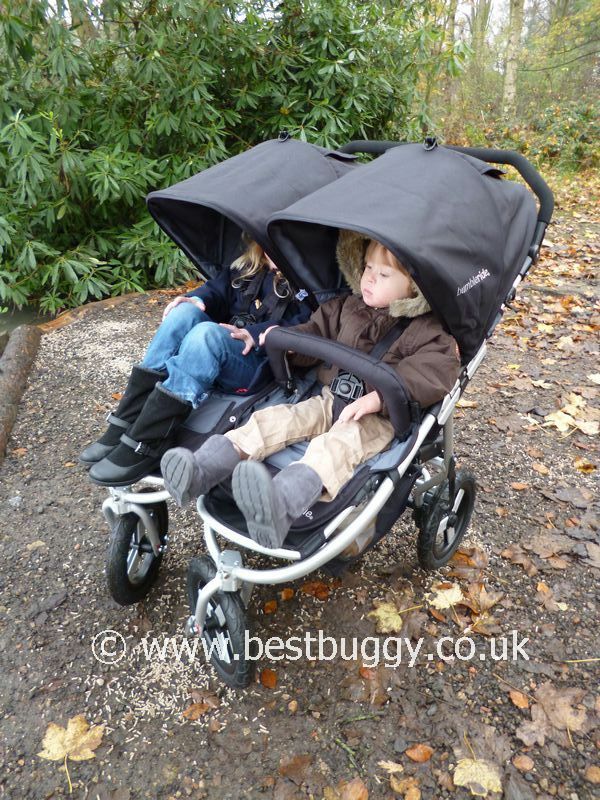 We have thoroughly enjoyed testing out the Bumbleride Indie Twin. With many thanks to Little Saints aka Bumbleride UK for their help to do this review.